In collaboration with the management of the “Teatru Astra”, the Gozo Creative Theatre Club will perform The Lord of the Flies by the playwright, poet and Nobel literature prize winner Sir William Golding on the occasion of the 60th Anniversary of the publication of this novel. During an unnamed time of war, a plane carrying a group of British schoolboys is shot down over the Pacific. The pilot of the plane is killed, but many of the boys survive the crash and find themselves deserted on an uninhabited island where they struggle to develop their own society. The characters discover fire, craft tools, and form political and social systems in a process that recalls theories of the development of early man. The Lord of the Flies deals with various issues such as, the nature of evil, dehumanization of relationships and the loss of innocence. However the overarching theme is the conflict between the human impulse towards savagery and the rules of civilization which are designed to contain and minimize it. The Lord of the Flies had been adapted for stage by Nigel Williams for the Royal Shakespeare Company in 1996. This play is still popular to this very day as there is a continuing controversy surrounding the political message of the novel and its view of human nature. This production will be directed by the Gozo Creative Theatre Club’s artistic director George Mizzi. The cast, made up of more than 20 actors, include Matthias Mercieca as Ralph, Andre' Refalo as Jack, John Psailia as Piggy, Dylan Attard as Roger and Sam Anthony Grima as Simon. 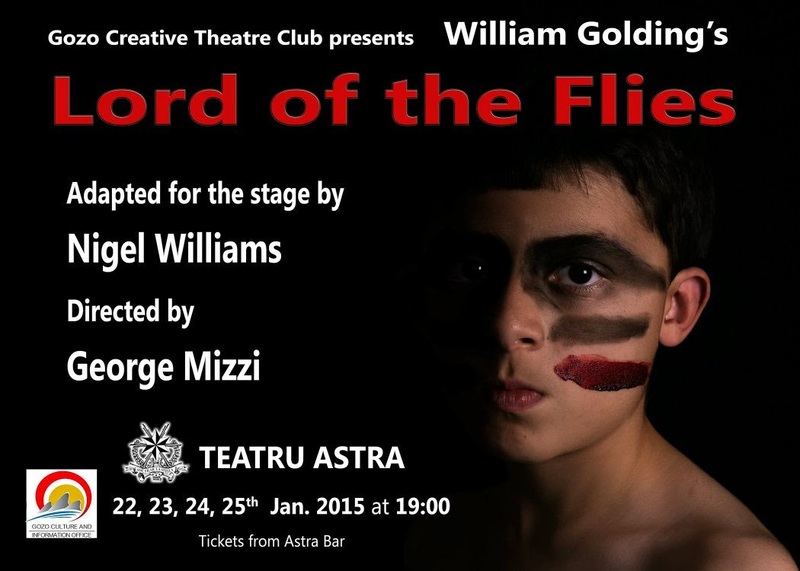 The Lord of the Flies will be staged at “Teatru Astra”, Victoria, Gozo on Saturday 24th and Sunday 25th January 2015 at 8pm sharp. Entrance is at €5.00 each and tickets are available at the bar. The seating will be limited to 200 people and will be on a first come first served basis. Special shows for Forms 5 and 6 students will be held on Thursday 22nd and Friday 23rd January 2015, where two shows will be held at 9.00am and 11.30am on each day. The entrance fee for these shows will be at a special students rate of €2.00.